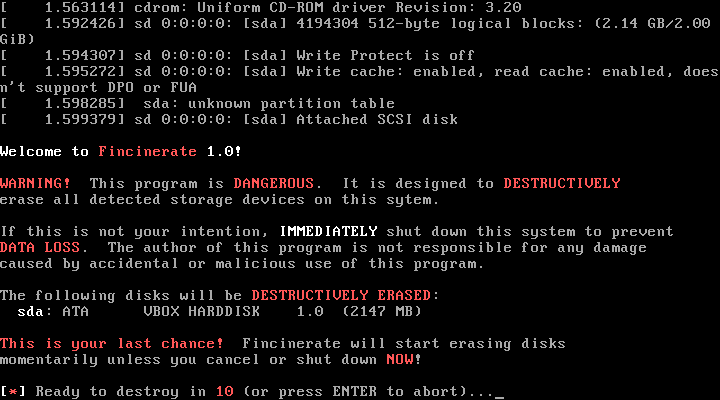 Fincinerate is a data destruction LiveCD, based loosely on Finnix. It has one purpose: boot on a system, find all writable block devices (hard drives, USB drives, etc) and wipe them. Fincinerate is a small download (currently 5 MiB), and includes many IDE, SATA, SCSI and other drivers for the purpose of finding data to wipe. The entire OS is contained within a kernel and an initial ramdisk, so you can remove the CD immediately after the kernel begins booting. It comes in two flavors. The main flavor will ask for confirmation before wiping drives. The "autoerase" flavor does NOT wait for confirmation, but will give a countdown to allow the user to abort. This flavor is designed to quickly start erasing hard drives in series on a number of computers. Simply put a CD into a computer, wait for it to begin booting, remove the CD and move on to the next computer. WARNING! This program is DANGEROUS. It is designed to DESTRUCTIVELY erase all detected storage devices on systems. If this is not your intention, avoid using this program; it WILL cause DATA LOSS. The author of this program is not responsible for any damage caused by accidental or malicious use of this program. Fincinerate was created for a project in order to wipe approximately 50 servers as easily as possible. For more information, see this blog announcement. It is hoped that this LiveCD will be useful for others, but it is obviously not for every day use. The author personally kept track of and later physically destroyed Fincinerate CDs after use on the intended project, so they would not be accidentally used on production systems. Fincinerate 1.0 "autoerase" flavor. The main flavor will ask for confirmation before beginning erasure. 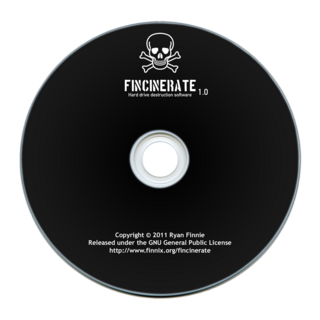 gpg: Good signature from "Ryan Finnie <ryan@finnie.org>"
Fincinerate is currently only available as a x86 LiveCD. A PowerPC version may be released in the future. By default, the bootloader will immediately boot the kernel. If you wish to add boot options, hold SHIFT during BIOS boot to reach the isolinux boot prompt. Boot options to control defaults such as destruction type are detailed in the readme.txt file on the CD. This page was last edited on 23 January 2011, at 05:28.